Description and Definition of Smoke Signals: Smoke Signals were used by many cultures including the Native American Indians as a means to quickly communicate visual messages over long distances. The simple messages sent via these signals were conveyed by means of columns or intermittent puffs or clouds of smoke. Native American Indian tribes had their own systems of Making Fire. Once a fire had been made smoke could be produced The fire gave off smoke consisting of visible gases and fine particles given off by burning material. A wet blanket was used to cover the fire and when released produced a tower of black smoke that could be seen for miles. These puffs of smoke rose and according to their number the message to be sent could be varied. 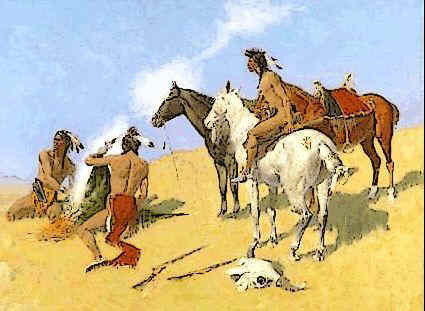 In order to send smoke signals over greater distances, some tribes would set up a chain of fires to relay messages from one location to the next. More than one fire and set of signals could also be used. An example of this a single fire was built first with one smoke signal that indicated success in battle. Then a number of smaller fires, in a line side by side, might indicate the number of scalps and horses taken. Smoke signals were sent by day and fires conveyed signals at night. The Meaning of one puff of smoke meant ATTENTION. The meanings of the smoke signals that needed to be kept secret in times of battles or Indian tribe warfare were pre-arranged, so only the sender and the recipient would understand the meaning of the signals.